When We're Not Reading We're...? My Little Reader, Isaac, hasn't done much but listen to me read him stories for the past few days. That's a great thing... right? Obviously, I love that he enjoys reading, and spends so much time doing it. But there are days I worry he's not spending enough time doing other things. (We mothers can always find something to worry about.) What other things do I feel he's not doing enough? I don't know!! That's what I'm hoping you guys can maybe help me out with. When you and your kiddos aren't reading, what are you doing? This is kind of a no-brainer, right? I mean, how can your child be interested in reading if there aren't books around to be read? Usually I see books kept in a child's room, but often that's the only place I see them. Books should be everywhere! In the kitchen. In the bathroom. In the car. In the living room. In your bedroom. With your outside toys... 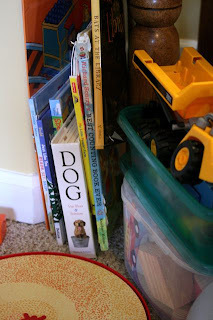 Anywhere your child spends any time on a regular basis, make space for some books there. You don't have to have a whole bookshelf, just a little pile. Even one or two will do. I also recommend that you give the books in your house a fair fight. By that, I mean don't have a room full of a million toys, and then a stack of a few books. The books will obviously get lost in the mix, and likely never even be seen, let alone picked up and read. Place as much value on the books as the toys. 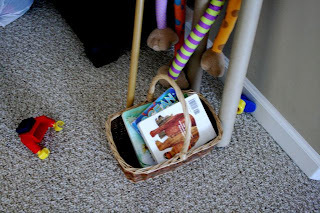 Give them equal play space, even setting some books out on the table, or the rug as you're setting out toys for playtime. It's also important to rotate the books that you have out around the house. 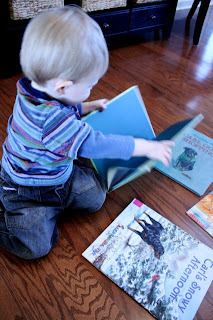 Kids (especially babies and toddlers) like to read the same book over and over. This is a good thing! But eventually everyone needs a little variety. Mix it up a bit, and keep them interested. 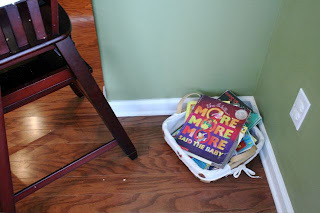 Having books everywhere is one step in the plan for "Fostering a Love for Reading." It doesn't work on its own. It must be combined with other efforts as well. But if this particular step in Fostering a Love for Reading is new to you, you may be surprised as just how powerful it can be to simply makes books available to your child everywhere. One more place I always have a book: my purse or diaper bag. Always handy! And this is especially neat if your child isn't used to you having a book with you. Pull it out as a special surprise while you're waiting in line at the grocery store. You don't have to necessarily read it to your child, hand it to them and let them flip through the pages as you unload the grocery cart. 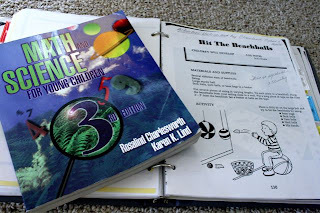 If you have an older child, keep a chapter book in the car or your purse that you can read a chapter together here and there when you're out and about and have some time to kill waiting around. And one last thing, if you have books everywhere, the books will do a lot of the work for you, as far as capturing your child's attention. But your child isn't going to stay interested in the books if you don't engage with them in reading as well. 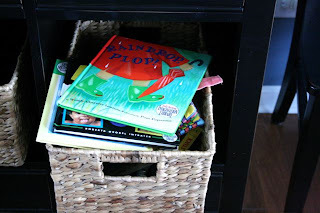 But having the books everywhere will make it totally easy and natural for you to encourage reading throughout the day, during playtime, during mealtimes, during bath time... When books are everywhere, they sort of naturally become a lifestyle. And that's the goal! Snowman Stories. Goodbye winter... unit. Couldn't pick which snowman story I wanted to read this week, so I brought both of the two I was debating to class with me. We read All You Need For A Snowman (Alice Schertle) and Snowmen at Night (Carolyn Buehler). I must say, it doesn't feel much like winter around here lately. We've been having thunderstorms and 50/60 degree weather. Anybody else? So it kind of felt weird to be reading about snowmen, but it was fun nonetheless. 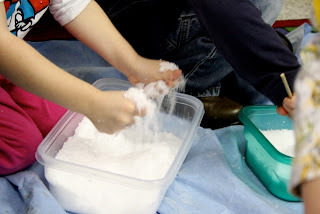 So it was more snowy fun in Literacy Launchpad. 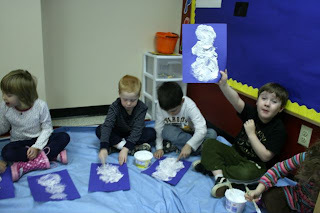 The students were thrilled; they had such a ball with the snow last week. I had a tough act to follow. I think they enjoyed the story and our own snowman making! See for yourself! Before I had kids I would hear this kind of advice a lot, and I gave this advice a lot myself as well. But I must admit, I was always a bit skeptical of whether it was really effective or not. Now that I have My Little Reader (Isaac) though, I can say that IT IS! Granted, I have been feeding Isaac a steady diet of books since he was a fetus, so I'm sure that helps, but I think this particular tip has helped his hunger for books grow and grow. 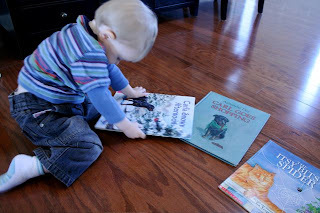 Obviously when Isaac was tiny, it was kind of whatever goes when it came to the subject matter of his little baby books. But now he actually has things that he's interested in, and it's SO MUCH FUN! It makes reading books with him even MORE enjoyable. I had no idea! There's this certain joy that comes with finding a book that you know your little one is going to go gaga over. 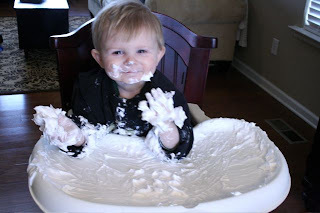 So far for me, it's been one of the most rewarding experiences when it comes to parenting... Who am I kidding? It's been one of the most rewarding experiences PERIOD. 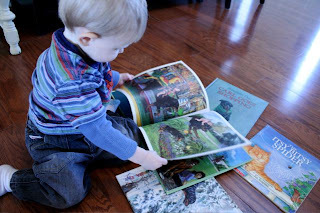 And the great thing about it is, once you start choosing a variety of books to read your little one, and you start discovering their interests, it then leads to new interests and then more new books to explore and enjoy. If you can find a book they like that's part of a series that's a bonus, because then you have a bunch of books ready to go that are likely to be guaranteed hits! Isaac has always been really into puppies and doggies. 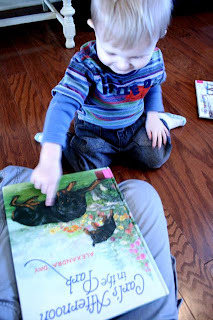 Maybe it started with us reading him Snuggle Puppy all the time when he was tiny (he loved it)? So recently I decided to get one of the Carl books (Alexandra Day) from the library. He loved it, and now we've been reading more books in the Carl series. Then we went to Toddler Storytime at the library, and they sang "The Itsy Bitsy Spider." He's been doing the little hand motions for it ever since. 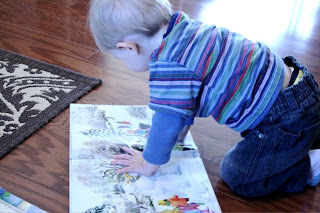 So I brought him over to my big bookshelf and got out my copy of The Itsy Bitsy Spider (Iza Trapani). He's really diggin' it. He asked for it a couple times today. Also, we've been reading Arthur's Christmas (Marc Brown) for about two months now. Ugh! He really fell in love with that one when he discovered that, in the book, Arthur has a piggy bank just like his piggy bank. 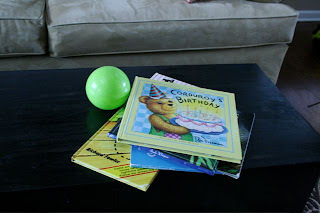 So today we finally went and pulled a new Arthur book off Mommy's book shelf - Arthur's Birthday. I think we read that one about four times today. Actually, the promise of reading Arthur's Birthday was how I got him to very willingly get into his PJs tonight. ... As I'm typing all this, I'm thinking of more topics Isaac is currently intrigued by that I need to go book-hunting for. Today's tip is not limited to just parents. Teachers, find out what your students are interested in and bring in some books from the library on the topic. Surprise them with it and say something like, "I know how much you love _____, so I found this book all about it at the library. Let's read it together!" How fun would that be for them? They'll probably end up begging you to bring them books on all kinds of topics. This is also a great idea for any kids in your life. I have bought my nieces books on topics I know they love. Bought one of them a knight book one Christmas. And this Christmas I got one of my nieces a story about Big Bird (one of her latest obsessions). Don't think you only should find books on topics they've demonstrated an interest in. Be sure to introduce books on new topics to them as well. Do both! For reluctant readers though, books on topics they're already interested in is a great place to start! 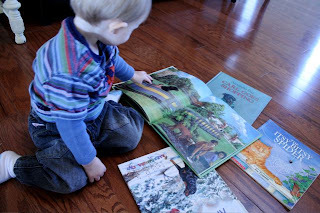 How have the little ones in your life responded to books on topics they're interested in? 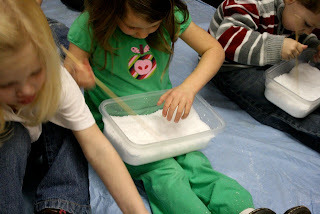 You can't always count on snow here in Tennessee, but you can always count on some snow in Literacy Launchpad during the month of January. We're in the midst of a chilly, winter unit, and loving every second of it! 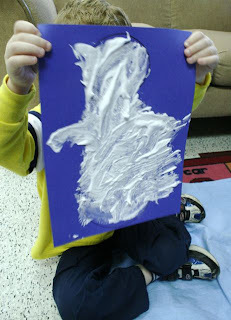 For our first week's lesson we read The Snowy Day (Ezra Jack Keats). When I first began teaching Literacy Launchpad, this story was new to most of my students... as far as I could tell. But this year most of my students had heard it prior to me reading it to them. Which is great! But it means I should probably find a new book to use in the future years. Broaden their horizons and all, ya know? 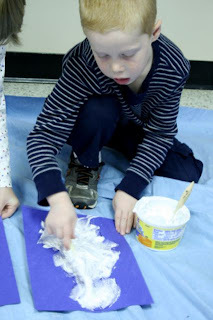 When we read The Snowy Day we get to play in the snow ourselves, like Peter! ... O.K. 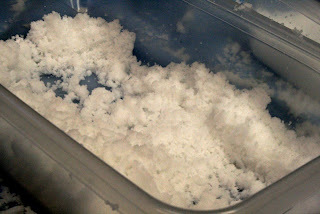 so it's not real snow, but I kind of think this fake snow might actually be more fun than the real thing. It's at least more fun than the kind of snow we get here in Nashville. This week we read The Mitten (Jan Brett). Last year we read Brett's The Hat during the month of January. And I was pleasantly surprised this week when I showed The Mitten to one of my classes and one student mistook it for The Hat (the covers look really similar). She got really excited (she remembered The Hat from last year), and proceeded to recap the entire story about Hedgie and all the animals. It was a validating moment for me, it was a great lead-in to The Mitten, and it got all the other students pumped about the story we were about to hear. 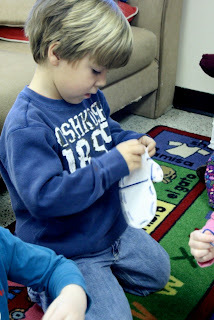 Our mitten activity after the story was fun, but I had some students disappointed that they weren't "real" mittens we were making. Hmm... I'm trying to imagine the comedy (or horror) it would be to try to teach preschoolers how to knit. And it would require me to first learn how to knit, which would likely be even more comical! 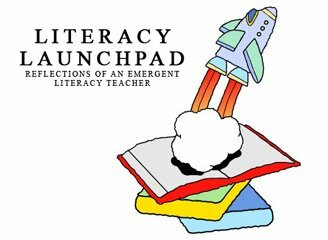 One of the reasons I created Literacy Launchpad was because I was seeing a lack of quality literature and literacy instruction in some preschools. These were schools filled with wonderful, loving staff. In my opinion it wasn't a problem with the school or the staff. Many of these teachers had ECE schooling and training. The failing lies with the institutions that are training and schooling teachers, in my opinion. There's a lack of emphasis on literacy instruction and its importance. So I'm so excited and honored that I have the opportunity to do teacher training at a local child care center next month. Woohoo! This is a wonderful school that cares a lot about books, reading, and literacy, and is taking steps to make that a priority in their classrooms and curriculum. How amazing is that!?! I want to wrap my arms around all those teachers... around the whole BUILDING and give them a big HUG! So... Here's your chance! 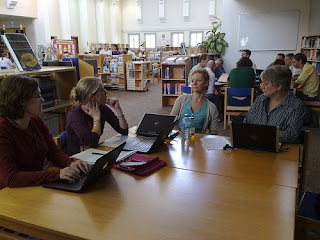 I would love a quick opinion from you all on what you think every teacher SHOULD know about literacy; what you WISH they knew about literacy, what every teacher MUST know about literacy. If YOU could be there telling them something, emphasizing something about books/reading/literacy, what would it be? If they were YOUR CHILD'S teacher, what would you want them to be doing/saying/reading/knowing? Can't wait to hear from you all! I'm hoping this will be the first of many teacher trainings like this! Let's hope! 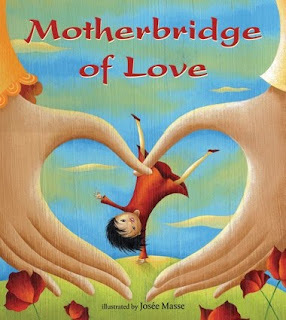 Robin, with Barefoot Books, sent me a copy of the book Motherbridge of Love, a book about adoption. I loved this book and really wanted to review it and share it with you all. Motherbridge of Love was a poem written anonymously for the charity Motherbridge of Love. It was then turned into a book and illustrated by Josee Masse. The illustrations depict the story of a Chinese adoption, but its message resonates with adoptions from any country. Written in the voice of an adoptive mother, to her adopted child. The text beautifully and tenderly explains how two mothers have both made loving choices, and have both contributed in meaningful ways to the happiness and well being of one child. I can't decide which is the real gem of this book, the text or the illustrations. They're both stunning. At first you'll be wrapped up in the poem as you turn the pages (if you're like me). And then you'll open your eyes to the clever beauty of the illustrations. They're as touching as the words of the poem. Most illustrations feature both the birth mother and the adoptive mother with the child, though sometimes the birth mother is represented in some other object in the illustration: the moon, or the landscape. I think my favorite illustrations is one that shows the birth mother in a kind of kimono robe with flowers on it; the flowery kimono fades into the illustration of a flowery field that the child is running through, flying a kite. This book is not completely relevant to my family's adoption situation. It's more the story of child that was adopted as an infant, and our children we're adopting are older. But it's still a great story to read with them and open up dialogue about adoption in general, and their feelings about it. And actually, our son, Isaac loves this book. He'll see it sitting on the table and ask us (by pointing and speaking in his little gibberish language) to read it to him. He can't get enough of it. We usually read it a couple times per sitting (per his request). I would recommend this book to any family. Especially if you're adopting, but also if you're not. There are all different kinds of families, as we all know, and it's nice to have stories that communicate that to our children and open up a discussion with them about it. Add this gem to your home library. Go buy Motherbridge of Love here! My awesome Mom is in town visiting. She leaves today though. I think I'm going to cry. There is something so comforting about having your mom around, isn't there? Anyhow, we wanted to get out and do something today, so we took Isaac to the local Toddler Storytime together. I must confess, I haven't been to storytime with Isaac in months! Life has just been too busy. ... And I haven't been ambitious enough to make extra excursions out of the house with him. Especially ones that require getting up and out of the house by 9:30 in the morning (storytime starts at 10 a.m.). This was our first time visiting our local Toddler Storytime. We have been to the "Snuggle Bug Club" in the past, which is for newborns up to 18 months. 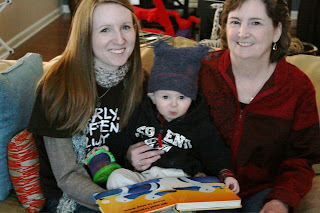 And we have been to the Toddler Storytime at my sister's library up in the Chicago area. I had heard good things about the Toddler Storytime, and I was quite pleased with it today. Though, of course, I had my critiques as well. The librarian leading the storytime had lots of energy. Especially for the cold, dreary, winter day that today was. Liked her! And so did the kids. She chose very age appropriate stories, and I loved that the illustrations in several included children of varying race and color (something my brain recently has tuned into a little more when exploring picture books). Music was incorporated. There was a mom there that played a couple interactive songs on her guitar (Isaac was very interested in her guitar). We all sang and did motions along with the songs. The librarian let the children and the parents get involved in reading the stories. We helped read along at parts, we got to make animal noises, do hand motions, and answer brief questions that made us giggle, and helped keep us focused on the story. The storytime was brief (about 20 minutes, maybe). The perfect amount of storytime for this age group. There was a craft afterward. The set-up in the room wasn't the greatest in my opinion. We were in a different room than the big, wide-open room they use for "Snuggle Bug Club" (which I LOVE). There were lots of tables set-up for the craft and then some chairs arranged around a small rug for storytime. It seemed difficult to be able to sit with your child in a spot where you could both see and participate. I was lucky enough to get a chair in the first row right next to the rug, but I'm guessing there were other parents that had to let their toddler go sit on the rug by themselves while they sat in a chair a few rows back (this is what my mom ended up doing). Not really an ideal set-up for parent and child to experience the story and interact together. There wasn't really any discussion of the story after reading them. We jumped quickly from one book right into the next. 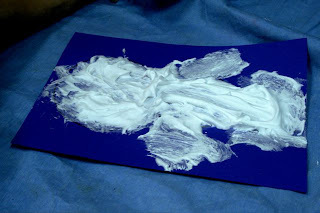 I suppose it was a good pace for little ones, but a question or two afterward might have been fun. There were kids in the group that were definitely capable of commenting on the story and such. The craft afterward had absolutely nothing to do with any of the stories we read. It seemed like more of an afterthought. 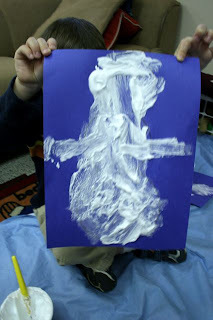 It was a snowman craft that involved taping cotton balls to a paper snowman. But there were only enough cotton balls on the table for each child to tape on one or two (times are tight for libraries, I suppose). Boo! 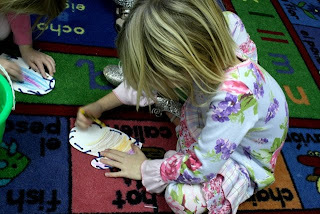 I like a craft or activity that relates to what was read and can be used to further discuss the story, or at least as something to remember the story by and discuss it further at home. How hard would it have been to read a story about snowmen during the storytime? I'm an certainly no storytime expert. I'm sure the librarians whose storytimes I critique would have a thing or two to say about my storytimes that I lead. Hee. But those are just a few thoughts I had about the experience today. We'll be going back, for sure! We enjoyed it. And I think these storytimes (even the ones for toddlers) will be great to attend with my Ethiopian children when they come home. Can't hurt with the whole English-learning thing, right? My mom and I giggled a little afterwards at the Dad's that were at the storytime. They didn't know quite what to do with themselves during the singing and the hand motion parts. They all seemed to be pondering the same thing: "Hmmm... Do I participate, or do I just sit here awkwardly?" 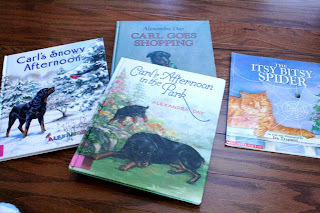 When storytime was over we chose a few of the Carl books (by Alexandra Day) to check out. Isaac loves them! And he also chose a book about brothers that he loves (Big Brother, Little Brother). What's funny is that at the end of the book it talks about the brothers being adopted. What a crazy coincidence! Perfect for My Little Reader to read and enjoy as he prepares for his new brother and sister to come home.